I’ve been making variations of this recipe for years and use it with all kinds of fish. It’s not exactly the healthiest way to eat otherwise healthy seafood, but it’s one of my favorite dishes nonetheless. It’s also why I can’t in good conscience pay $20 for blackened fish at a restaurant anymore when I know it only costs $4 to make. I used to make this with grouper and amberjack before the prices of those fish went through the roof. Now, I usually use tilapia or catfish. After experiencing varying results with this dish recently, I thought I’d finally quantify the ingredients and record the steps for posterity. Combine the Old Bay, Chachere’s, and flour in a bowl and dust evenly over the tilapia fillets. 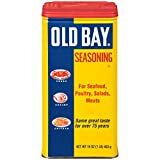 You can use only Old Bay or only Chachere’s, but, like I’ve said before, I think the saltiness of Chachere’s and the smokiness of Old Bay combine into a superior seasoning blend, kind of like the Voltron of the spice universe. Heat a 12″ steel or cast-iron pan over medium-high heat. I usually do this outside on my grill’s side-burner so that my house doesn’t smell like fish for days. Melt the butter and the olive oil in the pan and shake until incorporated. When the butter and oil start to pop, add the fish and shake the pan to keep the fillets from sticking. Cook until done, flipping once. How long you cook depends on the thickness of your fish. This tilapia took about 5 minutes on one side and 4 on the other. Remove the fish to a warm plate. Add the wine and the lemon juice to the pan and whisk until evenly combined. This will deglaze the pan. Lower the heat to medium-low and simmer until the liquid has reduced by half. Then add the cream and any juices that have accumulated in the plate with the fish. Whisk until the sauce is blended and turn off the heat. Taste the sauce with your fingertip. If necessary, season to taste with more spices, salt, pepper, and/or lemon juice. Plate the fish fillets over some rice, couscous, or microgreens, and top with the cream sauce. I served these fillets over some fried polenta this time. You know you’ve done this dish perfectly when the fish gets crispy brown around the edges (kind of like a well-fried egg) and the center of the fish is still soft and flaky. I thought Old Bay and Tony Chachere’s were available nation-wide, but I guess not. If you can’t find them locally, you can aways order them online. Or do a quick internet search for copycat recipes and make your own batch of those seasonings. This is a great sauce. I made a few additions for my taste. I added a small amount of minced garlic, roasted red peppers and a few dashes of red pepper. MMMM good.